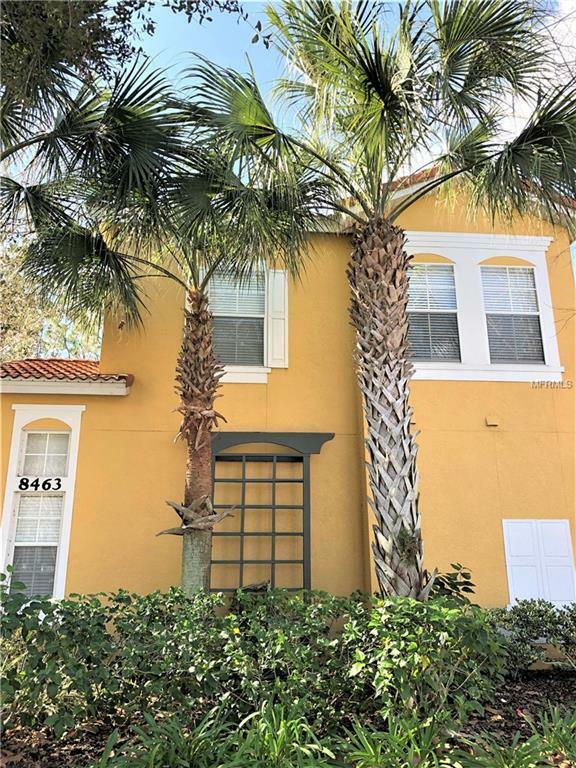 Beautiful and Furnished townhome in Emerald Island with all of the amenities of the community available such as swimming pools, clubhouse, fitness center, cyber cafe, volleyball, tennis and basketball courts and a nature walk. Basic cable and internet included in the HOA. This townhome offers two master bedrooms with a total of 4 bedrooms and 3.5 baths. A recently added outdoor deck with barbeque grill, full patio furniture and 2 outdoor heaters feature a serene view of conservation. Furnished with all new furnishings, electric blinds, self-flushing toilets, smart NEST thermostat and new AC unit, new flat screen TV sets, new fireplace, new curtains/blinds in all bedrooms, new dryer, microwave, all new ceiling fans, glass sliding doors in place of shower curtains and all new furniture. This home is ready for an investor or primary home owner to move right in. Close driving distance to Disney and the shops and restaurants on HWY 192, as well as access to I-4. Emerald Island is a gated community and is impressive and well maintained. One of the community pools is a short walking distance from the townhome.